A group of four webinars designed to bring you up to speed with the treatments we use for our cancer patients, many of who will receive a combination of these treatments. It is important to understand how these treatments work against the cancer, but also to consider their side effects and how they might be remedied. Quite a bit of science in these webinars, but brought over in a way that you will understand. Best suited for those that have been in their role for a while, but also work very well as a follow on for the ‘Cancer (not so) Basic’ series. Very suitable for MDT coordinators and nurses, along with research staff working with these treatments. Medical Scientific offers within pharmaceutical companies will find these webinars very useful. Cancer managers, service improvement facilitators, Cancer Research UK staff and many others have all accessed these webinars to further their cancer knowledge. This session is designed to introduce you to the concepts and aims of radiotherapy. As the webinar progresses you will begin to appreciate the differences between external beam radiotherapy and brachytherapy. Throughout the session, you will establish an understanding of the terminology associated with radiotherapy. Fractionation will be explained in terms that you understand and you will acquire a grasp of how radiation interacts with and kills cells. Radiotherapy treatment planning and the daily treatment processes will be explained, before introducing you to more complicated radiotherapy techniques – Conformal, IMRT, IGRT, Stereotactic. And there will be plenty of time to ask questions, thereby making sure that you go away from the webinar with a good grounding in what radiotherapy entails. Join me for this enlightening webinar and begin your journey in understanding about radiotherapy. Often wondered what a ‘chemotherapy cycle’ is? Or why we give chemotherapy in combinations? And why we give these combinations such names like ABVD, CHOP? And what do these acronyms stand for? Well you’ve come to the right place. Everything will be explained in this webinar. You will be introduced to the different categories of drugs – alkylating, antimetabolites, anthracyclines, topoisomerase inhibitors, mitotic inhibitors. You will begin to understand how a knowledge of the cell cycle underpins why chemotherapy is used and how it works against the cell. Unfortunately, chemotherapy does cause side effects…why is this and what are they? Join me for this excellent webinar and begin your journey in understanding about chemotherapy. The problem with radiotherapy and chemotherapy is that they cause too many side effects, and do not really pay attention to the difference between cancer cells and normal cells. Targeted therapies are designed to do just that. But what are these differences? Join us on this enlightening webinar and begin your journey in understanding about targeted therapies. To start the webinar, you will learn what the major differences are between cancer and normal cells. Once you have grasped these fundamentals, you will learn about monoclonal antibodies and small molecule inhibitors, and begin to appreciate their differences and how they can interact with the cancer cells. Lots of terminology explained in this exciting and interactive webinar. Immunotherapy is an exciting prospect in the fight against cancer – why? Join me on this webinar and begin to discover the possibilities that immunotherapy holds in treating all sorts of cancers. To begin the session, you will be introduced to the body’s natural immune system. 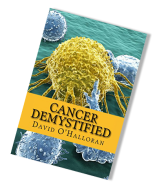 An understanding of this will allow you to grasp how the immune system can be harnessed to fight cancer. Throughout the webinar, you will begin to appreciate what a great job our T & B cells do. Therapies such as checkpoint inhibitors, cytokines and CAR (T) cell therapies will be explained in terms that you will understand. The potential is great, but there are also consequences to switching on our immune system. Join us on this webinar and find out more.